St Basil’s Cathedral at Red Square is one of the most well-known attractions in Russia, while the Moscow Kremlin and Kremlin Armoury are equally impressive structures. Kolomenskoye, a former royal estate, overlooks the Moskva River and provides wonderful views. 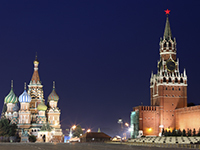 Russia is accessible from the United Kingdom in many ways, however, it is the largest country in the world and travel times will depend on where you are visiting. Taking an airplane from London to Moscow should take just under four hours, depending on your airline, while a London to St Petersburg flight will see this average increase to marginally over five hours. Driving to either of these locations will require around 31 hours, while a train journey will take around two days. Russia is two hours ahead of British Summer Time and three hours ahead of Greenwich Mean Time, which should not require excessive alteration of how your medicate your diabetes. However, if you are unsure as to how best to stick to your medication schedule then it is best to discuss a plan with your diabetes specialist. For safety reasons, the Foreign and Commonwealth Office (FCO) advises against all travel for certain areas in Russia, including within 10km of the border with the Ukrainian Donetsk and Lugansk Oblasts. All travel is also advised against to Ingushetia, Chechnya, Dagestan and the districts of Stepnovsky, Neftekumsky, Budyonnovsky, Levokumsky, and Kursky in Stavropol Krai. The FCO advise against all but essential travel to North Ossetia, Karachai-Cherkessia and Kabardino-Balkaria (including the Elbrus area), as well as within 10km of the border with the Ukrainian Kharkiv Oblast. The currency in Russia is the Russian Ruble. Most major credit and debit cards are accepted in hotels, large shops and established restaurants. There are no mandatory vaccinations required to enter Russia, but it is recommended for most travellers to receive vaccination for hepatitis A, which can be contracted through contaminated food and water. Rabies can be found in dogs, bats and other mammals in Russia. This is not a major risk for travellers, but vaccination is advised for people who will be working with or around animals, children, or those planning activities in remote regions that put them at risk of animal bites. Vaccination against Japanese Encephalitis may also be recommended for travellers visiting remote areas of Russia for more than a month, depending on what time of year you are travelling. Treatment in state hospitals is free in Russia, but you will need your passport as an essential document for this to be received. All prescribed medicine will need to be paid for, and it is advised to secure comprehensive medical insurance before travelling. Blood and urine testing kits are available in most large cities such as Moscow or St Petersburg, while the emergency services telephone number to be called in the event of an emergency is 112. Most syringes are generally sold at drug stories and pharmacies across Russia.